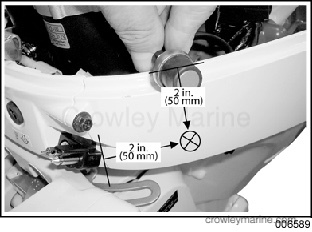 This electric start kit is designed for use on 2006 (SD) and newer 25 HP Johnson® (4S) outboards. DO NOT install on any other models. Disconnect 6 pin connector from CDI unit. 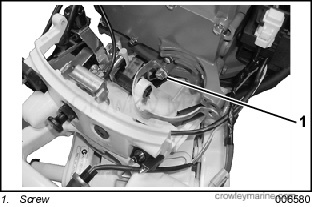 Remove CKP sensor mounting screws and stator retainer screws. 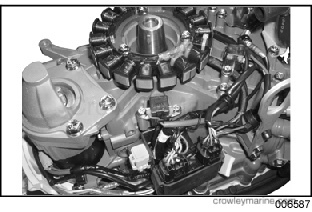 Remove stator and sensors. 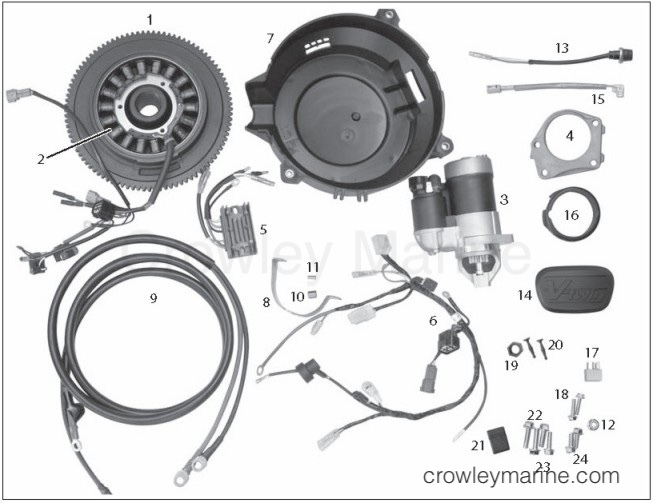 Disconnect wire harness from oil pressure switch, temperature switch, neutral switch, stop switch, ignition coils and CDI unit and remove wire harness from engine. Remove front panel screws to allow installation of starter band screw. 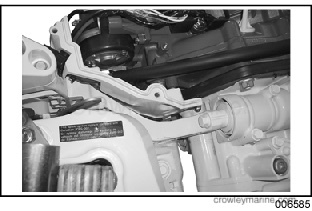 Install starter band and inner screw. Do not tighten at this time. 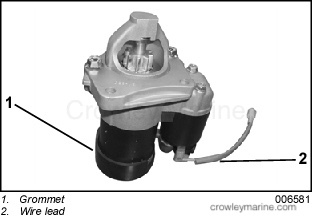 Install the starter grommet on starter housing and wire lead on “S” terminal of starter assembly. 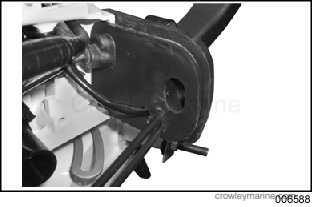 Install starter bracket on starter assembly with screws provided. 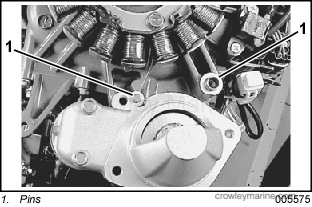 Install the two locating pins into crankcase as shown. 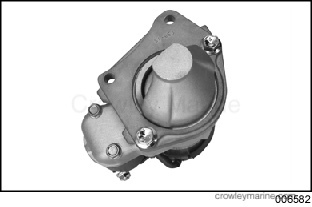 Position starter assembly with grommet in starter band. Grommet must be positioned on band and starter bracket must be positioned on locating pins. Tighten all four (4) starter bracket screws to 16.5 ft. lbs. (23 Nm). Install wire clamp on PORT starter band screw. Tighten starter band screws to 16.5 in. lbs. (23 Nm). Position front panel and re-install the two front panel screws. 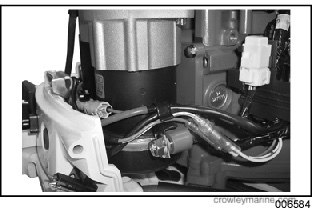 Install replacement wiring harness. Connect all switches and clamps. 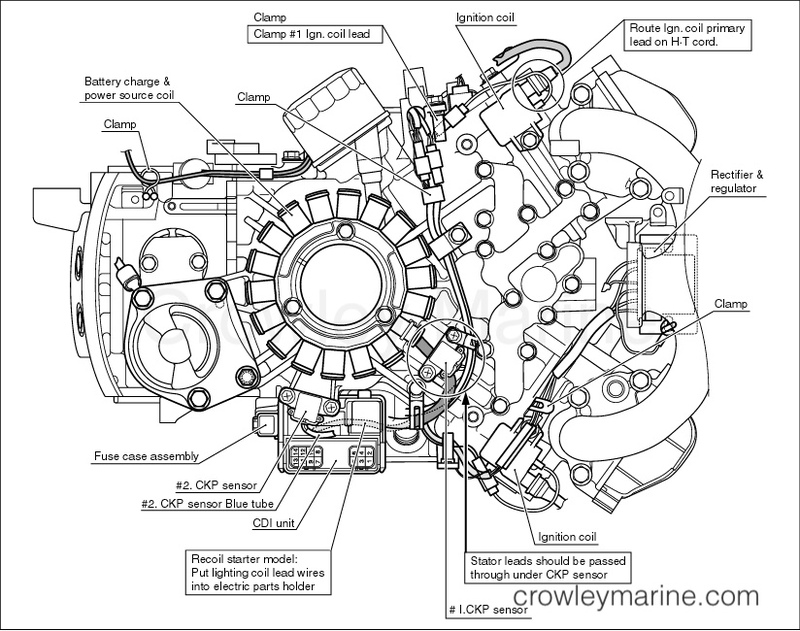 Refer to wire routing diagram on next page. 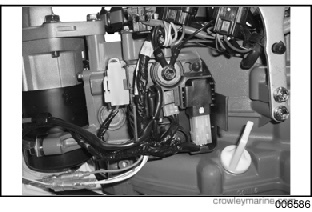 Route wiring into electrical parts holder as shown. Connect starter relay to harness. Install grommet on relay. Position relay and grommet and fuse holder in electrical bracket. 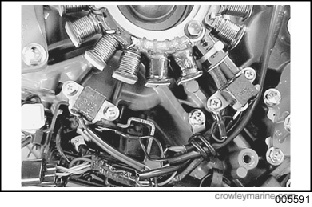 Connect wire harness connectors to CDI unit. Position CDI Unit with grommet in electrical bracket. 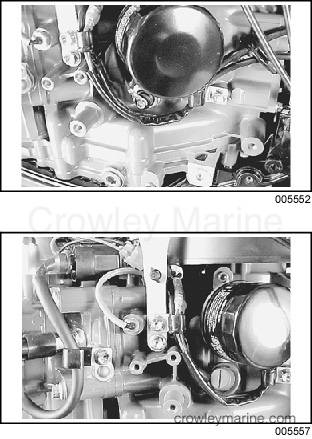 Install positive battery cable on “B” terminal of starter assembly and negative cable under front starboard starter bracket screw. 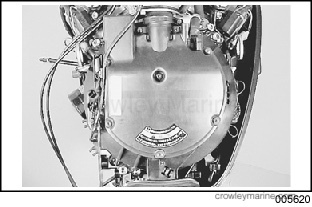 Open oval shaped hole in motor cover grommet. Route battery cables through oval hole in grommet. 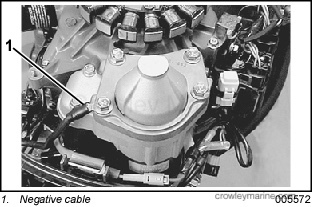 Position wiring to prevent interference with shift linkage. 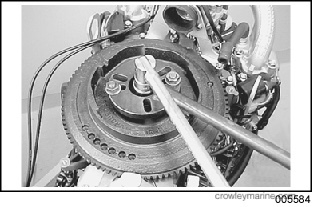 Clean mating surfaces of new flywheel and crankshaft with cleaning solvent. Install new flywheel. Use flywheel holder and tighten bolt to 142 ft. lbs. (196 Nm). 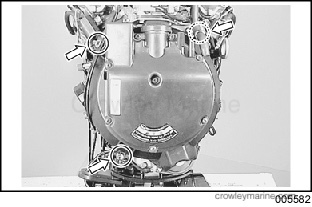 IMPORTANT: Perform final check of wire routing and check all screws are tight. 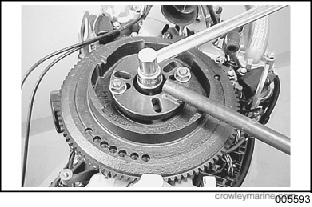 All wires must be clamped properly to prevent contact with rotating flywheel. Refer to wire routing diagram. 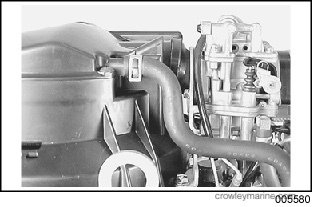 Mark port side lower motor cover as shown. Carefully drill a 9/16 in (14 mm) hole through motor cover. Install start switch and nut in hole. Tighten nut to hold switch securely. Connect start switch wiring. Install air silencer on new flywheel cover. 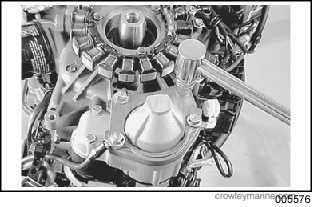 Install flywheel cover. 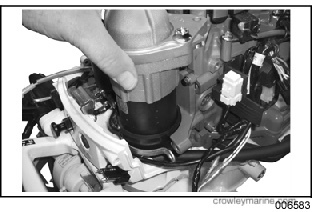 Connect the outlet hose to carburetor adaptor. 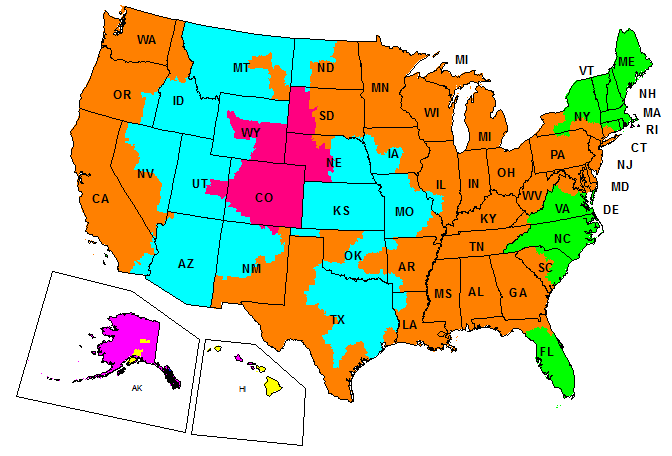 Connect breather hose. Install lower covers. 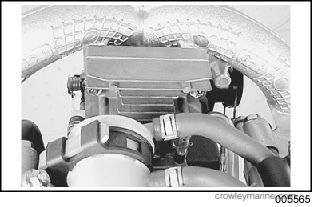 Connect water hose from starboard cover. Reinstall spark plug leads. 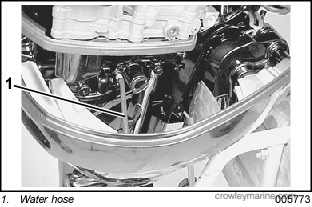 Install plug (emblem) in upper motor cover. Reinstall upper engine cover.